Unwedge is a 3D stability analysis and visualization program for underground excavations in rock containing intersecting structural discontinuities. Safety factors are calculated for potentially unstable wedges and support requirements can be modeled using various types of pattern and spot bolting and shotcrete. Use Unwedge to quickly create a model, perform a safety factor analysis, place reinforcement and interpret the results. Unwedge's Windows-based interface provides an easy to use, graphical environment for data entry and visualization that greatly simplifies the analysis and design process. Popup windows allow for easy entry and modification of model parameters, and easy to use editing tools provide a convenient method for performing parametric studies. The graphical data interpreter provides a rich set of tools, including 3D animation, for the convenient display of wedges surrounding the excavation. In addition to allowing for simple point and click geometry input/editing, Unwedge provides enhanced support models for bolts, shotcrete and support pressures, the ability to optimize tunnel orientation and an option to look at different combinations of three joint sets based on a list of more than three joint sets. Unwedge uses a new analysis engine based on Goodman and Shi's block theory, which includes the ability to incorporate induced stress around the excavation and the effect on stability, new strength models such as Barton-Bandis and Power Curve, and the ability to improve the scaling and sizing of wedges. 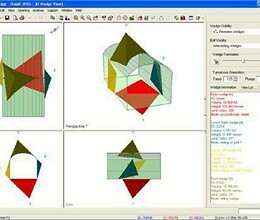 * Unwedge download link provides trial version of the software. Swedge is a quick, interactive and simple to use analysis tool for evaluating the geometry and stability of surface wedges in rock slopes. Examine2D is a 2-dimensional plane strain indirect boundary element program for the elastic stress analysis of underground excavations. 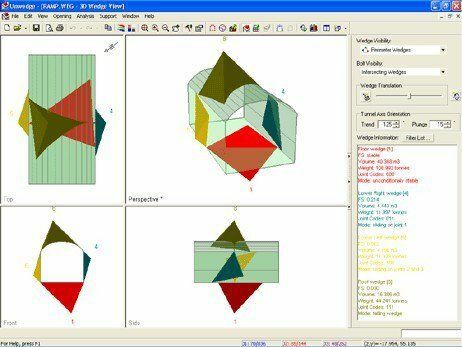 RocTopple is an interactive software tool for performing toppling analysis and support design of rock slopes. Unwedge has been rated 5.0 out of 5 points. A total of 1 votes cast and 0 users reviewed the software.